Simple, Flexible and Honest Online Ordering! Putting you back in control .. Affordable prices, no contract, no start up fee, no hidden costs ... it works or you don't pay a penny and that’s 100% guaranteed! Nothing to loose and so much to gain, come join other restaurants and takeaways that are re-gaining control of their business online and saving £000's a year in the process. 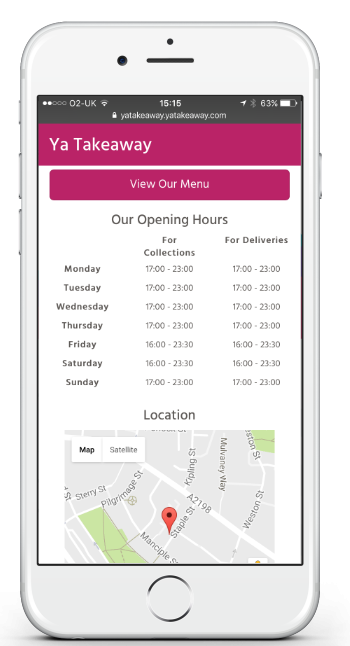 The YA Takeaway platform has all the features you need to manage your customers effectively and get those all important repeat orders. We work closely with our community of restaurants to enhance and continually improve these features and we're not done yet! We listen to your feedback and will rapidly respond and role out any new features you need to get your business flying, which everybody in the community will then benefits from! All our sites are super fast to load and effortless to navigate. They are web optimised to work on all devices, giving you App-like functionality whatever the device. This means less clicks for your customer to place an order, leading to more repeat orders for you! We give you different payment backend options and you will be guided through the setup with one of our experts, to find the best option for you. The best bit is the money goes straight to you; your bank, not ours! Precise and flexible: You decide how often they run, which discounts to benefit your customers and when, e.g. for 2 hours on a Tuesday or to celebrate a bank holiday. Also through the use of Up-Sells you can increase the total value of a customers order. Keep your finger on the pulse of your success. See real time information on sales, promotions uptake and customer base growth. Plus you can generate reports at the click of a button. We aim to be fair and simple in all aspects of our offering, everyone gets the same! We go with a hybrid model. On one hand, your website is your own and independent of others. On the other, you are part of the community; each site improvement is shared so all can benefit. All updates are instant, so you don't take a performance hit. We give you a 24/7 accessible customer database, which grows with every order- Already have your own? We can import that too. We even make it easy for you to download. And hey, if you ever want to leave, you can take it with you. You get our full feature set. You can be online taking orders within 1 hour! Your sales have more than doubled since your first contribution. Interested? Want to find out more about how you can benefit? Copyright © 2017 Mitore Solutions Ltd. All Rights Reserved.